Crime scene cleanup is available for Staten Island and Tri State area residents via the Mazzei Group. Yes, when the unthinkable happens, the staff of The Mazzei Group Environmental Projects Division are here to respond. Your physical as well as your mental health is our primary concern and we are dedicated to the recovery of all accident, crime, trauma and bio-hazardous cleanups. Anything from suicides, homicides, hoarder cleanouts, sewage back flows, microbial contamination issues such as Norwalk Virus, MRSA, Legionella, H1N1, C-diff and many more. Our technicians are available to respond 24/7 for crime scenes, death, and blood clean ups in the Tri-State area.Unfortunately, in the after-math of tragedies and criminal activities there is a scene that must be cleaned. That is where the dedicated staff of The Mazzei Group Environmental Services Division enters to offer their unique services. To truly appreciate the cleaning process and what The Mazzei Group EPD is willing to do for you, it pays to first acknowledge the appearance of the typical crime scene. Crime scenes that require specialized kind service are ones that typically involve a homicide or other type of criminal activity. Sadly, an example of such a sight would be a murder crime scene. To that end, death scene cleanup usually entails disposing of a great deal of biological matter. Therefore, for the safety of both you and our trauma scene cleaners, The Mazzei Group EPD ensures that the appropriate crime scene cleanup supplies and protective gear are utilized at all times, during the cleaning process. Crime Scene Cleanup Supplies: What is Used for Crime Scene Cleanup? The crime scene cleanup supplies used by crime scene cleaners is basically standard but also, very comprehensive. 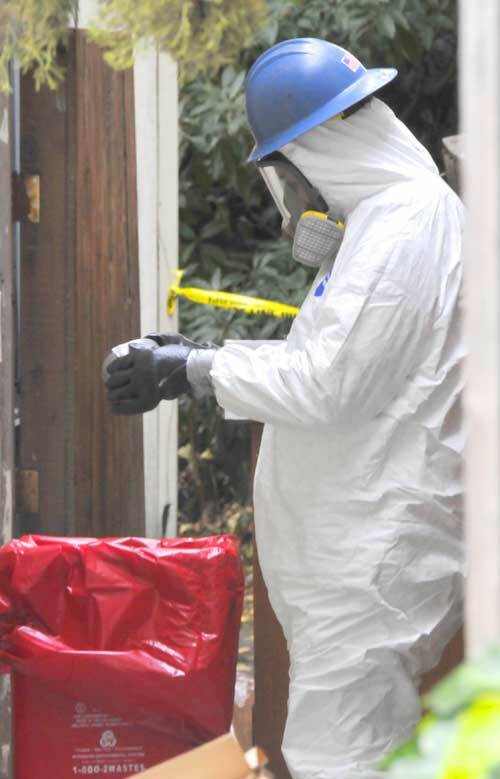 For personal protection, the crime scene cleaner uses a one use body suit, gloves, a respirator (to avoid inhaling possibly air-born contagions), and chemical spill boots. As far as containers to transport matter from the scene, fifty-five gallon bags and hard plastic containers are staples in the crime scene cleaners’ arsenal. The crime scene cleaner also employs the tools of any skilled porter, including mops, buckets, spray bottles, sponges, brushes, and tools of that nature. The more unique tools of the trade are ozone machines to purify the air by eliminating odors; foggers, used to thicken cleaners to ensure that the cleaners fully permeate the areas needed to be cleaned, and enzyme solvent, used to both liquefy blood and kill bacteria and viruses that might be present at the scene. However, quite possibly the most unique tools of the trade are a truck-mounted steam-injection machine used to liquefy biological matter that cannot be removed in its dry form, and a chemical treatment tank, employed to disinfect and store matter that is essentially vacuumed up at the scene). Finally, our intuitive crime scene cleaners use some conventional supplies of other trades in some unconventional ways in order to guarantee that the site is cleaned thoroughly so you and your loved ones can resume your normal routines and move forward with your lives. It is our mission to utilize whatever means necessary to make the transition back to your day-to-day life as easy as possible. When tragedy strikes, the last thing you should have to worry about is the cleaning process. Let us handle that for you, so you can attend to more important matters.